The December transit stats were finally posted this week from the Federal Transit Administration, so I updated the National Transit Database site and updated the code for annual ridership stats. Nationwide, there were 9.85 billion transit rides in 2018, compared to 9.78 billion in 2017. This represents a 2.01% decline year-over-year. Peak ridership, according to National Transit Database data, was in 2014 at 10.48 billion rides. This means that ridership has dropped 8.4% since 2014. 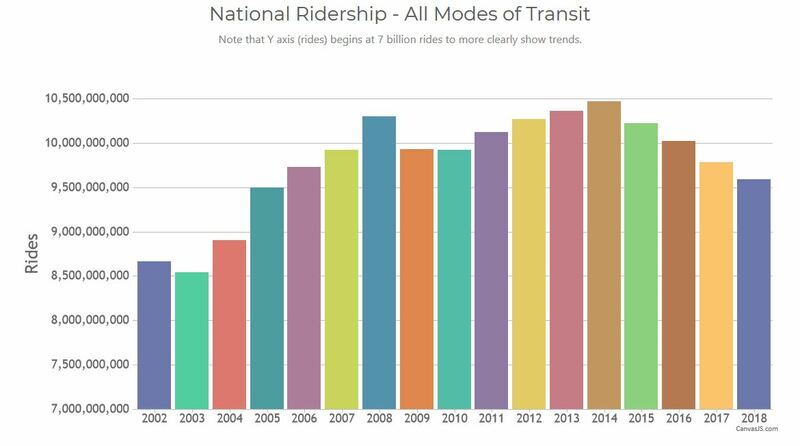 Ridership is basically where it was in 2005.